I bought some Shasta Daisies a week ago to put around my mailbox. They are so bright and cheerful. Well, I glanced down at them today and oticed one of the yellow centers had a white petal laying on it…. or so I thought. But it’s actually white petals growing out of the center. I brought it inside where the sun was just setting and a glow came in through the windows. It took awhile to get a good perspective but I had fun figuring it out. Then the background was a hodge-podge, so I picked up a burgundy placemat and moved it slowly back and forth behind the flower to blur any wrinkles. Nature is full of fun surprises! 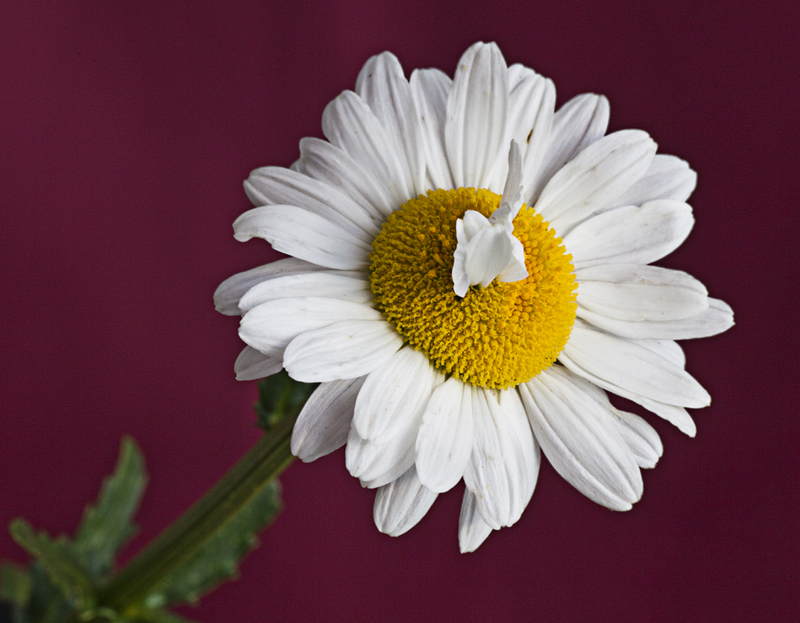 This entry was posted in Camera Technique, Uncategorized and tagged Backgrounds, Shasta daisy. Bookmark the permalink.